The occurrence of diaper rash, among diaper service users, is significantly less when cloth diapers are used exclusively than when paper diapers are also used. In this survey of 1003 diaper service customers, only 6% of those respondents who use only cloth diapers reported current cases of rash as opposed to 13% among those who also use paper diapers. 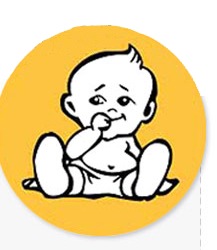 Moreover, just 46% of infants diapered exclusively with cloth diapers had ever had a rash as opposed to 58% diapered at least occasionally with paper. Paper diaper usage appears to coincide with more frequent incidence, mild and short—lived rash outbreaks. These findings are in concordance with those of an independent study on diaper rash conducted by W.E. Jordan, Ph.D. (1), among infants of diapering age (1 to 20 months) with no qualifications on type of diaper used. Dr. Jordan’s sample was comprised of four percent cloth only users, forty—three percent cloth arid paper users and fifty-three percent used paper diapers exclusively. In this sample approximately 60% of the infants studied currently had a diaper rash. Moreover, three—quarters of the respondents reported that diaper rash had occurred at least once in the previous two months. Although the two studiescannot be compared directly due to differing methodologies, the results tend to confirm that paper diaper users experience a higher occurrence of diaper rash than do those who use cloth diapers exclusively. (1)Jordan, W.E., et. al., “Diaper Dermatitis: Frequency and Severity Among a General Infant Population”. Pediatric Derma 1986; 3 (3); 198-207. Los Angeles (Orange County), CA, Cleveland, OH, Philadelphia, PA and Greensboro, NC. Each city represents 25% of the total sample. Forty—nine percent (49%) of respondents reported that their infants had ever experienced diaper rash. There was a significant difference between those using cloth diapers exclusively (46%) vs. those using paper diapers at least occasionally (58%). Seven percent of all infants in the sample were currently suffering from diaper rash. Among exclusive cloth users, six percent currently had a rash, compared to thirteen percent among occasional paper users. When respondents reported using paper diapers more than thirty percent of the time, the percent with a rash rose to sixteen. The sample consists of parents of infants of a diapering age (1 – 20 mo.) The vast majority (93%) of respondents had used a diaper service since the birth of their baby. While all respondents used cloth diapers, at least one-quarter of the respondents reported that they also used paper diapers on occasion. Among the paper diaper users, paper diapers were used an average of 20% of the time. When a finding is described as “significant” or “statistically significant”, this means that a probability level of at least .05 (that less than one time in twenty similarly drawn samples would this finding appear by chance) has been achieved. That significance level applies uniformly throughout this analysis. A copy of the questionnaire and the computer tabulations are included in the appendix of this report. When asked how often diaper rash occurred, nine percent said at least once every month. This percent decreased among exclusive cloth users (7%), but increased significantly among occasional paper users (14%). At less frequent outbreaks, the differences between exclusive cloth users and occasional paper users was insignificant. Only fourteen percent reported outbreaks every eight weeks or more, while thirty-four percent said the rash occurred every two months or less. –16% among those who use paper more than 30% of the time. *Statistically significant from “cloth only” group. Only 27 people in the sample used paper more than 50% of the time. Since this number is too low, for decision-making purposes, no comparison was made for this group. Rashes were generally short-lived, usually lasting between 1 and 3 days. For rashes lasting one day, there was a significant difference between exclusive cloth users (10%) and occasional paper users (17%). The majority of respondents reporting the occurrence of diaper rash said the rash was “mild”, and over three—quarters said either mild or irritated. Severe or extreme cases were much less common. The only significant difference between exclusive cloth users and occasional paper users was in the mild category. Among total respondents, twenty four percent of exclusive cloth users reported a mild rash, while thirty-two percent of occasional paper users said the rash was mild. Several reasons were cited as causing diaper rash. Fourteen percent listed the cause as illness, diarrhea, or teething. Nine percent blamed paper diapers, and eight percent said the diaper was not changed often enough. Other causes were allergies, introduction of new food, the weather, etc. However, looking only at occasional paper users, the most frequently mentioned cause of rash was paper diapers (17%). Illness, diarrhea, or teething was mentioned by fourteen percent and the diaper not being changed enough was mentioned by eleven percent.